Justine’s works often begin with creating three dimensional forms with paper and scissors, manipulating and modifying until she has the essence of an idea formed. From there the work must take place in clay using the thinnest of sheets and manipulating quickly before it dries too much to bend. 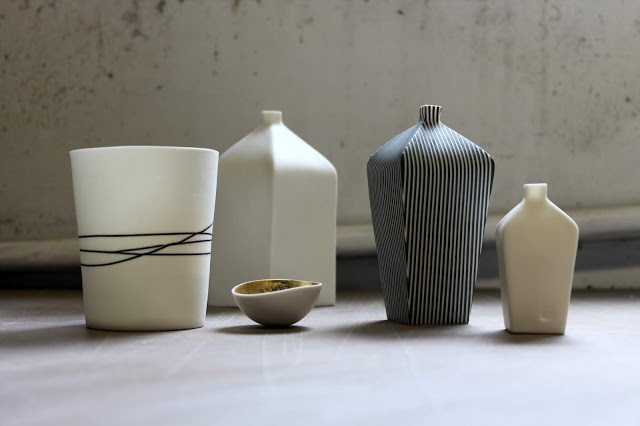 There is a tension at this stage when working porcelain; one moment it is so soft and floppy that control seems impossible, then suddenly it’s losing moisture rapidly so cracking results if you try to bend or join it. A seemingly impossible task to control such a wayward material into a delicate precise form. Once the form is made it must be nurtured through the drying process and eventually given over to the heat of the kiln when it will take on a life of its own once more, twisting and moving as it becomes almost molten – the key to its ultimate translucency.